This portable dehumidifier revolutionizes where and how you can use a dehumidifier. 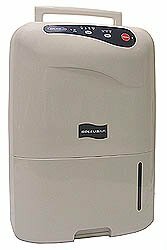 This room dehumidifier is half the weight of a conventional unit and can easily be carried from room to room. This dehumidifier unit has an adjustable humidistat with three levels, auto defrost, a washable air filter and more. Power consumption 330 W, tank capacity 6 L, noise level 41 db, weighs 31lbs. Power supply 115V - 60Hz. Air flow 88 CFM. Available in two models: 40 pints/day or 20 pints/day - see drop down menu for options. . A restocking fee will be deducted if this item is returned. This portable dehumidifier revolutionizes where and how you can use a dehumidifier. This room dehumidifier is half the weight of a conventional unit.